Despite the on-and-off sun and unseasonably cool temperatures (highs are forecast to be in the 60s all this week), the solar powered irrigation system meets our needs. It's core elements are a 3,000-gallon tank on a thirty-foot tower, a Danish-made Grundfos pump in the ground, and 4 130-watt Kyocera photovoltaic panels on the barn. The system came together last August after about 9 months of planning, design and fabrication (and digging of trenches!). It works well. The Grundfos pump works on available power and thus pumps from slow to fast depending on the quality of the sunlight. On a typical day it fills the tank in 6 hours. At 30' elevation, the tank provides about 15 pounds of pressure to the drip irrigation system, just exactly what is needed. With all of my irrigation valves turned on, the tank empties in about two hours. With all valves on and the pump on, it empties in about 4 hours. With about half the irrigation system turned on and the pump on, the system is more or less in stasis, with the tank filling as fast as it empties. It has, in other words, plenty of capacity for my current need plus a bit more. Groundwater is a scarce resource and we do our best to use it wisely by irrigating only when needed, by extensively mulching, and by concentrating as much of our production as possible in the winter months, when natural precipitation can meet plant needs. The solar panels also charge batteries located in the workshop. They in turn run a 12 volt Sundanzer freezer and some local lighting. The system is semi-automatic, in that I need to manually direct power to the pump, but it shuts off automatically when the tank is full. Breba* are back, larger, more abundant, and about 2 weeks ahead of last year's crop, despite the continuing cool weather, which is all the forecast holds at this point. The fig trees, three of them, planted in early 2007, are now 8-10 feet tall and have been adding a couple of feet in height and width every year. Fig trees are native to the arc of land from Pakistan to Portugal and have been cultivated for millenia. The fruit of the tree is actually neither fruit nor flower, but infructescence, a hollow-ended stem enclosing flowers and seeds. The small hole opposite the stem, or ostiole, provides access for a specialized small wasp that pollinate the flowers, but since the wasp did not travel as well as the fig itself, parthenocopic (literally "virgin fruiting") varieties were developed for growing outside of the fig's original geographic range. The fig is a member of the mulberry family, and the mulberry fruit itself (pictured below) is a three-dimensional mirror of the fig, with flowers and seeds arranged facing outward along a central spine. Also in the mulberry family are dorstenia, a tropical plant with flowers and fruit arranged on a flat open surface, a structure intermediate between that of the fig and the mulberry. With a little warmth, we'll have ripe figs, one of summer's real treats. Last week witnessed a visit from Sam and Corinne, en route from London, UK, to Bristol, UK, via China, Southeast Asia, New Zealand, and North America; we were their penultimate stop in a six-month odyssey of geographic and personal exploration. They are workers in the non-profit arena, promoting volunteerism, corporate civic engagement, and programs for youth. They will make new roots in Bristol beginning next week, energized and focused by the half-year of travel. They were delightful, both individually and together, with an equality and synergy of relationship not at all reflected in their choices of position in the greenhouse. Corinne fell in love with 14 newly-hatched chicks. I counted them after she departed and we've still got 14. The barn swallow is the most widespread of the swallows (and called simply "swallow" in much of Europe, where it is the national bird of Estonia). Its five subspecies occur across the Northern Hemisphere, and most are long-distance migrants. Ours winter in Central and South America, returning north to breed and raise their young. It's a very vocal bird; we eavesdrop on extended, often contentious, group discussions of topics we can only guess at. The photo above depicts a first for us - the forced occupation of a barn swallow nest by a house sparrow. Barn swallows make a simple cup nest (as below) and occasionally adorn it with a feather or two, always white (only occasionally to excess, as when a mom or dad decided a couple of years ago to attempt to adorn a nest with an 18" long feather from an egret in breeding plumage). House sparrows, on the other hand, are garish, taste-less nest-builders, throwing in everything but the kitchen sink. Here they've added found bits of paper and plastic to an amalgam of grass and straw. There goes the neighborhood. We hope it's not a trend but fear it might be. The plant is borage (Borago officinalis), the critter, of course, a European honey bee (Apis mellifera). Borage is an annual, although it would be easy to be fooled on this point, since they self-sow readily and in this climate there's always borage in some stage of growth in the garden. We planted one many years ago and we've never been lonely for borage. Borage originated in present-day Syria. It has been cultivated historically for culinary and medicinal uses. The star-like blue flower goes well in salads; it is one of the very few naturally blue edible things. In Europe the leaves are cooked and eaten as greens. Borage seeds are high in good acids and oils; it is the best known plant-based source for gamma-linolenic acid. It's a good complement to any vegetable garden, like an old friend quietly hanging around. One of the challenges of gardening in excellent bird habitat is that some of the birds come to believe you're gardening for them. 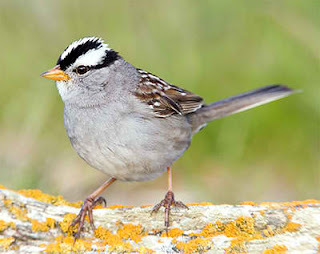 We're relatively fortunate - the only real problem bird for us has been the white-crowned sparrow, which is in the neighborhood from November to around the first of May. It is a significant nuisance. The white-crowns have a well-developed taste for tender plant material and an unerring ability to find germinating seedlings. Lettuce is the first choice, and it's normal in winter to see a flock of 50 or more birds treating a row of lettuce like a salad bar. I cover everything susceptible - lettuce, carrots, broccoli - with either floating row-cover (a light white fabric) or bird netting elevated on hoops. They tend not to bother the stronger cabbage-family greens such as kale, or onions, garlic, and fava beans. The books, which they apparently don't consult, say they eat insects and seeds. The covers came off and went into storage this week. What a nice change to be able to see, and easily access, what we're growing. There are multiple "races" of white-crowned sparrows with different ranges, migratory patterns, and vocalizations. Local experts say our birds go to Siberia to nest and breed. I think of it as banishment, albeit temporary.